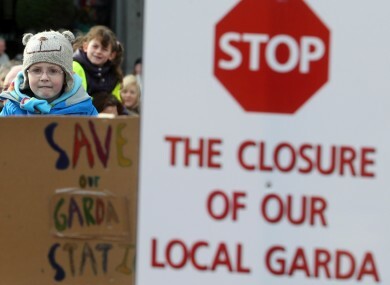 People at a demonstration protesting the closure of Stepaside Garda Station in Dublin. THE CLOSURE OF 139 Garda stations throughout the country is saving the state €556,000 a year. Justice Minister Frances Fitzgerald said the estimated savings on utilities and maintenance as a result of the closure of each station building is approximately €4,000 annually. “The key objective involved when closing Garda stations was to promote the more efficient and effective deployment of resources rather than to secure modest cash savings,” Fitzgerald said. The minister was responding to a parliamentary question asked by Sinn Fein TD Pádraig Mac Lochlainn. The stations were closed between 2011 and 2015. “The Garda authorities advise me that policing services in all areas continue to be provided as required through the revised structures. In addition, the centralisation of services will facilitate the introduction of enhanced patrolling systems that will be operational and intelligence led,” Fitzgerald added. Continued Garda presence in communities. The most recent crime statistics from the CSO, released yesterday show there were 28,830 burglary and related offences recorded in the 12 months up to the end of June 2015 – representing an increase of 2,241 (+8.4%). Comparing the previous 12 months, aggravated burglary offences rose by 1.6% while recorded not-aggravated burglary offences increased from 25,619 to 27,890. Murders and drugs offences dropped, but sexual assaults also increased. Email “We only make €4k a year from each of the 139 closed Garda stations ”. Feedback on “We only make €4k a year from each of the 139 closed Garda stations ”.